North Shore Medical Center (NSMC) offers state-of-the-art heart examinations. Heart examinations are a crucial means of diagnosing and managing heart disease and other cardiac conditions. For patients on Boston's North Shore, the NSMC Heart Center offers fully integrated cardiac services, including comprehensive testing services. Heart examinations at the NSMC Heart Center are performed by physicians and clinically trained technicians. Heart rhythm monitors (Holter and event monitors). This type of cardiac evaluation monitors recorded heart rhythms over periods of 24 hours or longer, to test for any rhythmic irregularities. Stress tests. Stress examinations measure the response of the heart to a greater demand for oxygen, recording the electrical activity of the heart during walking and running. Cardiac ultrasound. 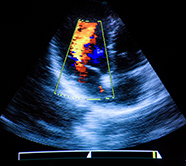 These heart examinations use ultrasound technology to determine the size and function of the heart muscle and valves. Tilt table. For patients who experience fainting spells, this device enables physicians to produce and observe a fainting spell under controlled conditions. Patients on Boston’s North Shore who require cardiothoracic surgery have access to world-class cardiothoracic surgeons through our decades-long collaboration with Massachusetts General Hospital. Cardiac surgery is now performed at Mass General, while all other aspects of a patient’s heart care are provided through the NSMC Heart Center, including cardiac exams. North Shore patients can receive exceptional care from top cardio vascular surgeons at a location close to home, with compassionate clinical care provided by a team of North Shore physicians, nurses, clinical assistants, administrators and support staff. NSMC provides a range of clinical programs to help patients and their families manage their recovery from cardiac surgery. These include our Living Well with Heart Failure program, which has once again received a top-performing ranking from U.S. News and World Report. Learn more about heart examinations and cardiac surgery Boston.